One of the three-space extension invasions is on the third line at the centre of a mixed-height extension, in which it is the most common. a is the most common answer, b is aggressive and c allows to escape temporarily but possibly prepares for a large scale attack. 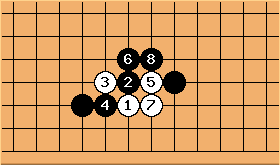 d is rather uncommon, while e allows to escape but forestalls the attachment there. tapir: a is the most common answer, followed by d, e, f other moves are rarely played in professional practice. Bill: It is worth noting that this invasion is rare without other stones in the vicinity. 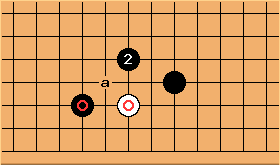 The attachment above is the primary basic move learned by amateurs as it tries to connect Black's two stones. Then at a is usually best, but requires two ladders for White ( ) to work. b is not as severe. The other hane is not recommended. If White wedges, Black must choose between playing atari from above or below. Black may take the outside like this. Black can also sacrifice a stone in order to seal off the side and influence the centre. Atari from below: thickness on the low side. connects. captures in a ladder. may also be at . If the ladder after does not work, then this is catastrophic for White. 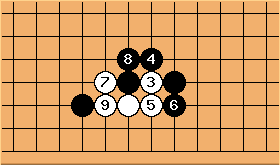 Black sometimes plays there, which leads to a fight. Note that is one of the few moves that break both ladders at once. captures a stone. Black cannot exploit the cut at a because there is a liberty at the marked point. 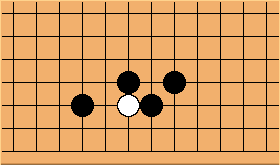 If Black wants, he can still revert to one of the results of the wedge, by blocking at . 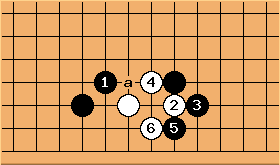 The kosumi is an enclosing move. 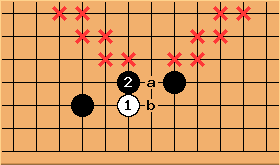 In the mixed extension, it lacks severity as opposed to countering the invasion of a three space extension on either the third or fourth line. While uncommon in professional play, it is a good response for attacking at times when White's invasion is unreasonable. 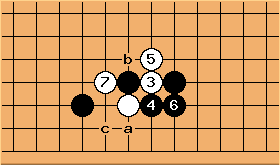 In contrast to the attachment it does not contact the invader so seeks to avoid giving White momentum to settle (Don'tTouchWeakStones), but conversely has a weaker connection to the fourth line stone so if White settles or gains enough liberties there are possibilities of cuts and counterattacking. 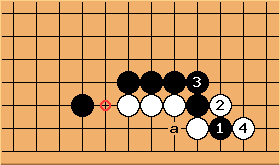 If White uses common techniques for life, attaching at and , she may be submitted into a very low position. Black hanes again at and White is unable to end with good shape. Cutting at immediately at a instead of requires winning a large ko, impossible in the opening. 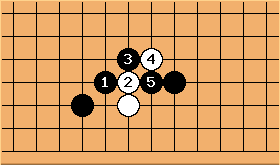 Otherwise White lives with a dango, and Black makes shape all around. 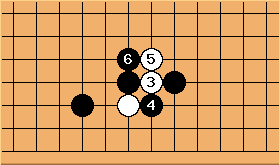 White requires nearby strength to have the ability to pull out and attack one of the black chains. Otherwise, the invasion lacks severity and Black will profit on the outside. Pushing through with and is a bad idea. 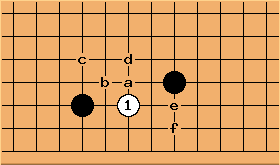 Black's stone on the 4th line is ideally placed to support the cut at . White is in dire straits. This is a powerful but slow way to threaten escape. If Black answers above ( at ), White lives much more easily. 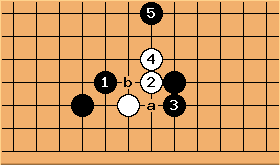 The only problem is White has bad shape, as can be seen after the eventual exchange of a for b. 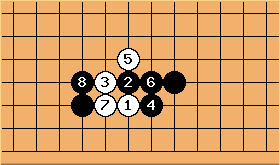 This is another variation Black has the option of playing if the circumstances allow counterattacking the invading stone. 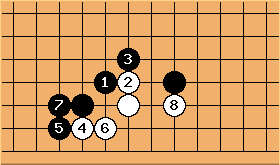 Going back to "pushing through," the tesuji at nicely supports White's threat to break out, forcing . is not necessarily a good exchange, but White can enlargen her eyespace this way at the expense of any groups to the left. 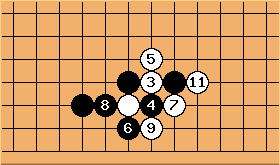 If White does not follow Black's plan and play inside the elephant jump, Black will eventually enclose here. 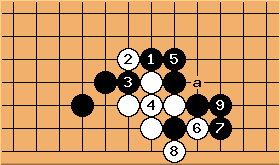 The diagonal move a is typically slow for Black as well. 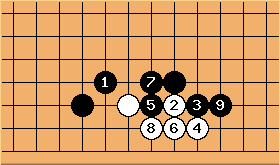 By comparison, the formation after Black gets a second move following the attachment is more simply connected, thicker, has more real/definite territory but is smaller (less potential or maximum territory), has less desire to develop nearby (i.e. is more settled) and is less speedy and/or influential. 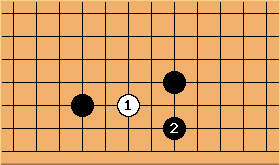 A one point jump from the third line stone is playable, suited for simplicity and defense of the left. 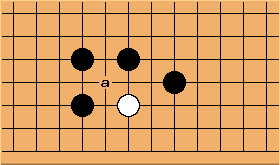 White will want to take the key point at and Black's extension is ruined. Even though this situation is fundamentally undesirable, White's profit from splitting Black into two groups is not immediate, and there is a good chance that by running out this way White's group will become heavy. In a handicap game or other unreasonable circumstance for , this according to Black's plan may be simply doubling down on an untenable fight. 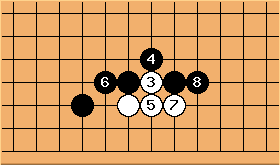 If the separation is not dire, play will continue elsewhere, Black looking after the two sides and aiming for an enclosing move a or thereabouts, White trying to harass the two groups and seeking severe possibilities either before or after Black's next move. This jump, on the other hand, is a correct move. The shape is excellent, threatening to connect by attaching underneath (or above) . Clearly center moves will be more commonly the best direction over this second-line defense on the right. 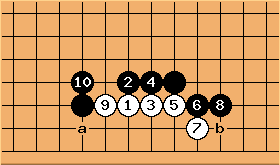 In conclusion, there is no easy way, with good shape, to help the third line stone on the left, and this is what requires some planning on the part of the two players when preparing for the invasion. Hane on the low side ? Timm/10k : Is this why the hane on the low side isn't recommended ? tapir: d, uncommon acc. to the page is in my database the second most common answer after a, while b is exceedingly rare and c does not happen at all. e and f follow in popularity. See also my question here: BQM584. I notice in the database it seems to be pretty rare in Japan (recently played more by young innovators with more international exposure), while highly common in China and Korea. 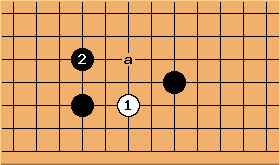 The first example is fairly typical, with the Black "standard opening" with the leaning manoeuver prepared or already on the board.